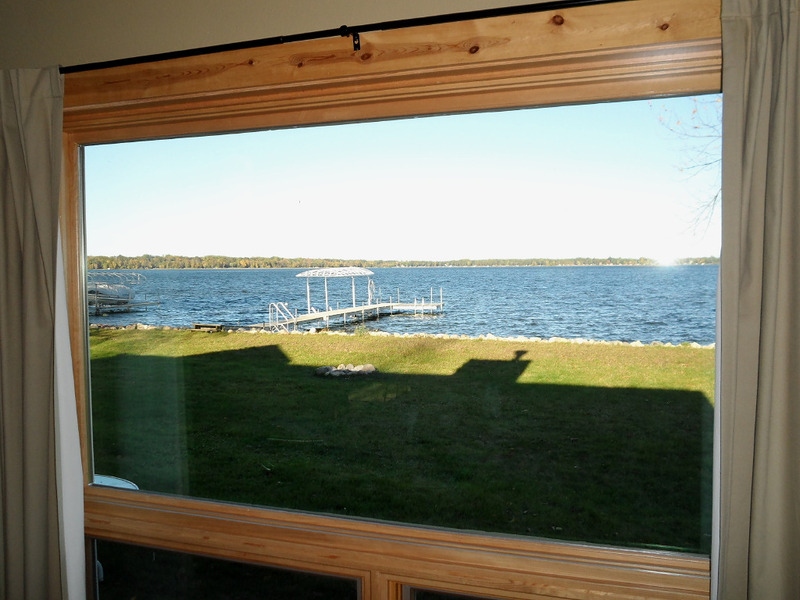 Robison Point sits on the very tip of Ovig's Point, in Merrifield Bay, on North Long Lake (a lake comparable to the popular Gull Lake). We're 13 mi beyond the 371/210 intersection in Brainerd/Baxter. 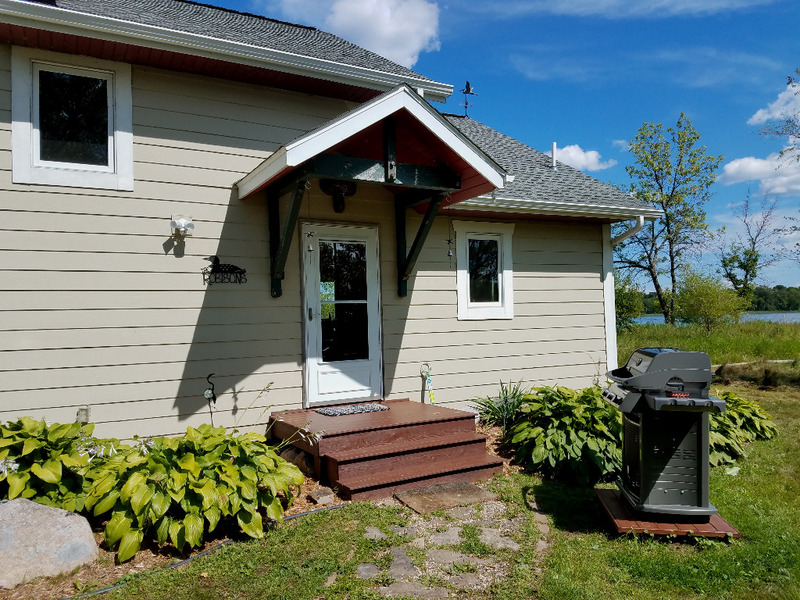 The cabin sits just 60 ft from shore, on a 0.67 acre lot, with approximately 540 ft of lakefront (275 ft of which is usable). 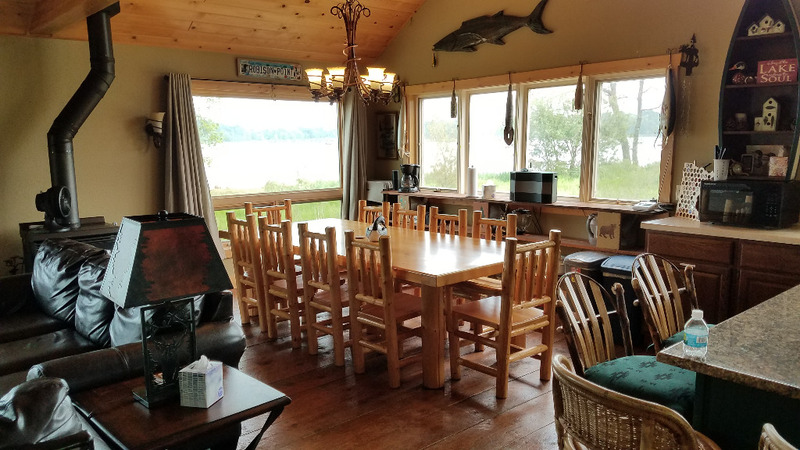 There is abundant wildlife surrounding the cabin, including: several species of songbirds, loons, osprey, eagles, ducks, geese, red fox, raccoon, white-tail deer, fire flies, frogs, etc. Stay for a week, and you will likely see and/or hear all of them. The cabin has two bedrooms and one bathroom on the main floor, and another bedroom and bathroom in the loft. 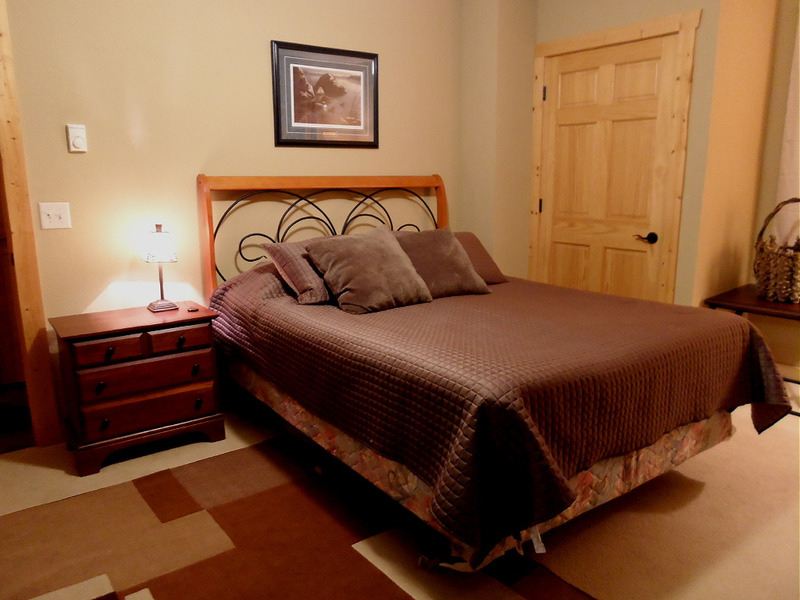 We have enough beds to accommodate up to 9 people - more if your guests are willing to sleep on air mattresses. 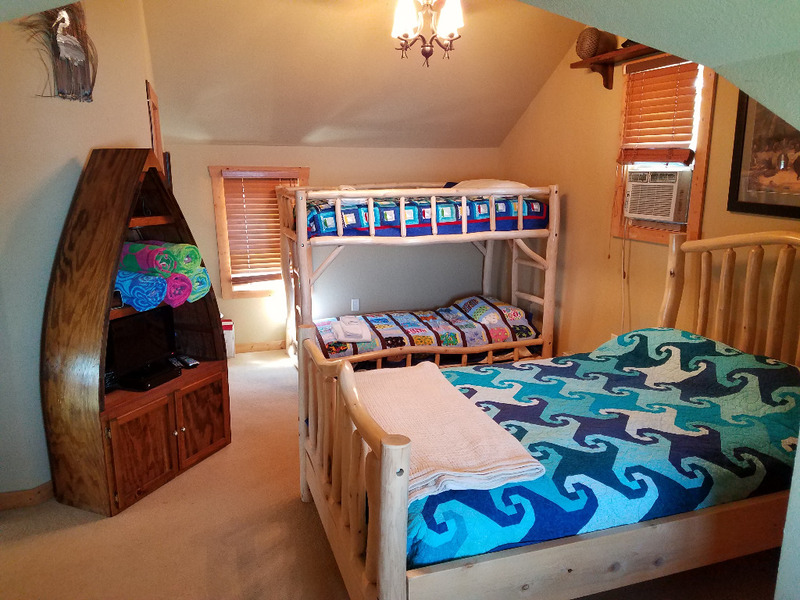 There is a queen bed in the front bedroom, an (extra-long) twin-over-queen bunk bed in the rear bedroom, and a twin-over-twin bunk bed and (extra long) full-over-twin trundle bed in the loft. All three bedrooms have ceiling fans. The upstairs bedroom has a small TV (w/ cable). 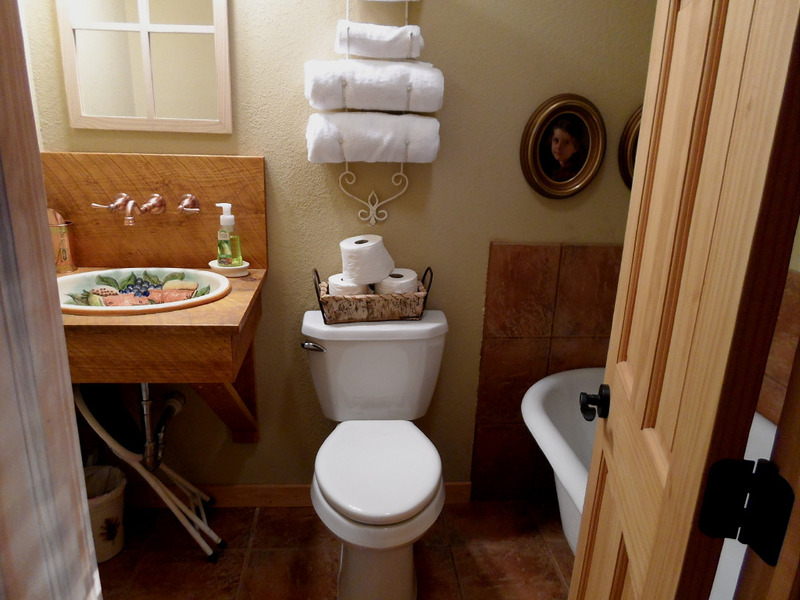 We provide all linens and towels. 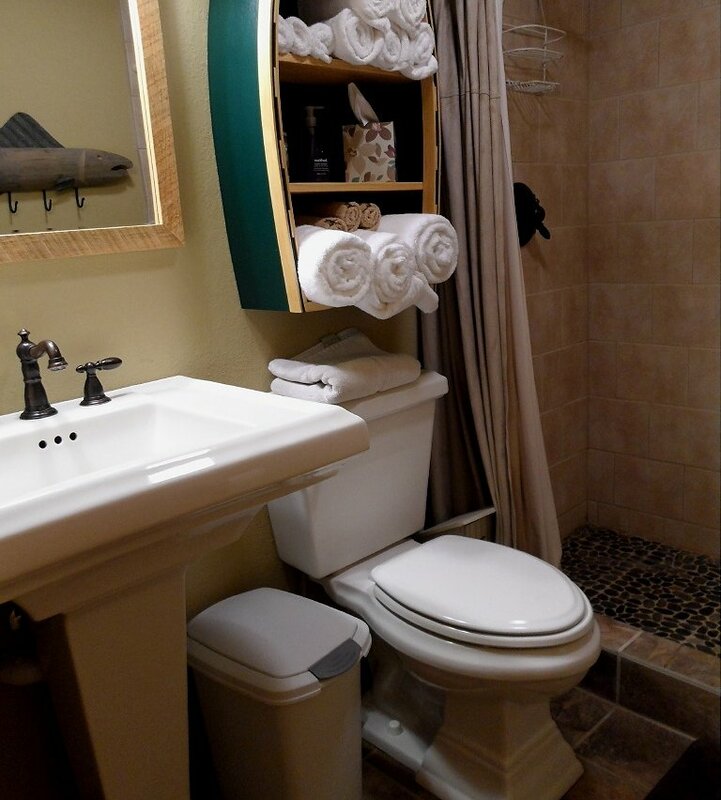 The main floor bathroom has a large shower, and the upstairs bathroom has a free-standing bathtub. We also have a Pack-N-Play you are welcome to use. The kitchen, living room, and dining room are all located in one large space under a vaulted pine ceiling on the main floor. 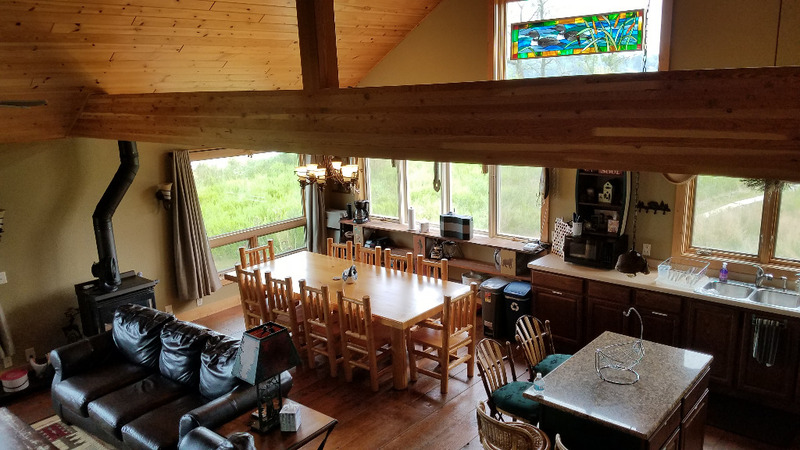 There is a kitchen island with four stools, and a large dinner table with 8 chairs. We can provide extra tables and chairs, e.g. for scrapbookers and quilters, if you just let us know what you need. 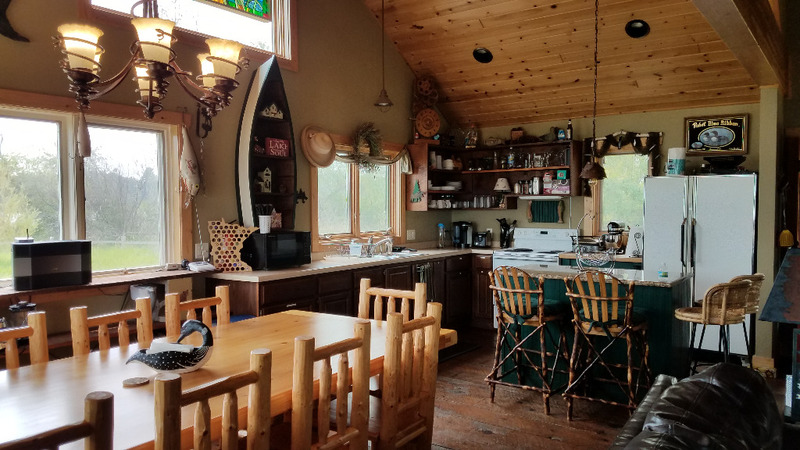 The kitchen is fully equipped with an electric stove/oven, Cuisinart 5-in-1 Griddler, microwave, toaster, blender, two large refrigerators, a Keurig coffee machine, and all of the eating and cooking utensils you could ever need. 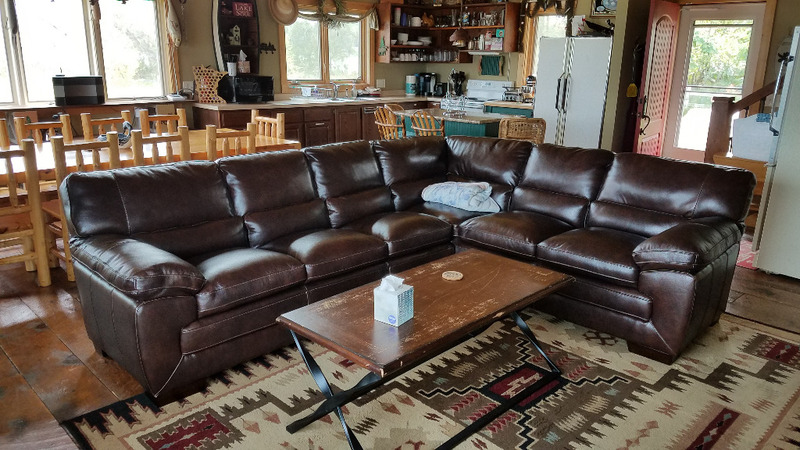 The living room has a large leather couch and a matching loveseat. There is a large LCD TV with cable and a Blu-ray player. The cabin also comes with wi-fi access, if you would like to stream video, play online games, or just check your e-mail. Outside, there is a wood deck with a large picnic table and an umbrella, along with a bench that doubles as a patio box. A gas grill is provided for you use (we provide the propane). 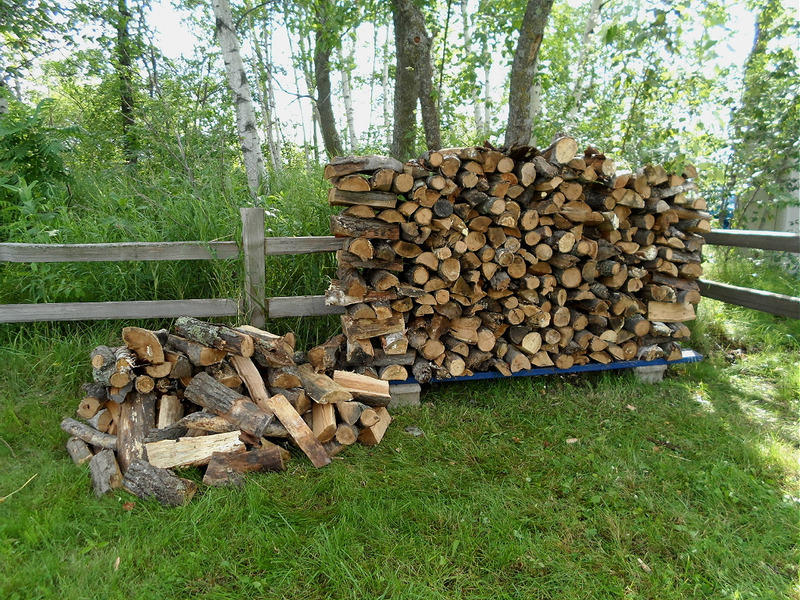 We also have a fire pit, with plenty of free firewood provided. There are several deck chairs and four Adirondack chairs for people to drag around the front yard to sit wherever they please. We have two docks. One is meant for swimming, and the other for fishing. 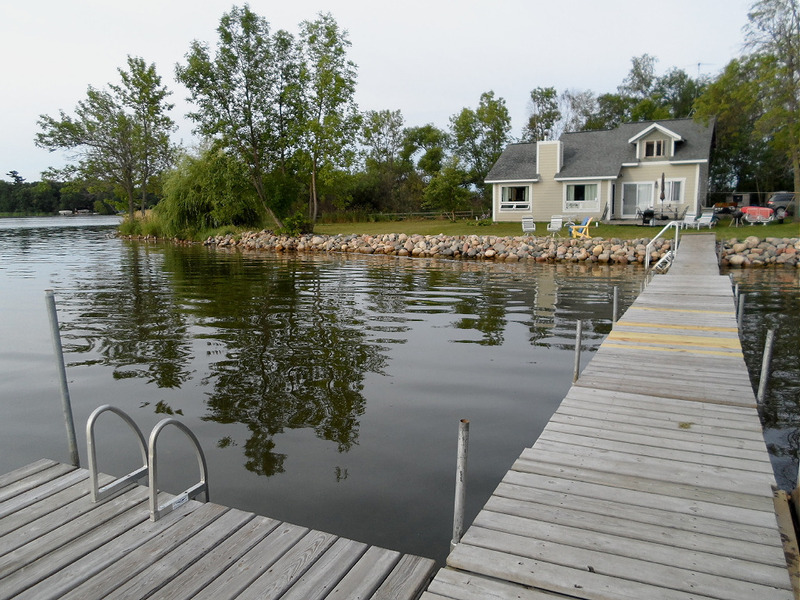 The first dock is located directly in front of the cabin, and it sits in about 3 ft of water on a hard-sand bottom. It has steps on one end for easy access to the shallow water, and a ladder on the other end so children may repeatedly jump off the dock to their little hearts' content. The fishing dock sits on the very tip of the point, right on the edge of a drop off that falls from 2 ft down to about 30 ft. The fishing off of this dock is so good, boats frequently anchor just in front of it to fish. Robison Point is 1.2 mi down a backroad, which makes for peaceful early-morning walks or jogs. For bikers, the Paul Bunyan State Trail is just 4.2 mi away, and you can ride it all the way into Nisswa (6.5 mi) or Brainerd (9.1 mi). If you're bringing your boat, the nearest boat launch is conveniently located just across Merrifield Bay, in the town of Merrifield. It is about 4.8 mi away by car, but only 1.3 mi away by boat. It is a modern launch with a concrete ramp and plenty of parking. Our property would be a perfect match for most groups, especially families with young children, scrapbookers, quilters, and dog owners. However, the property would not work well for large groups looking for a place to party into the wee hours of the morning (many of our neighbors are families with young children, and late-night noise would not be tolerated well). Just let us know, and we will assist with any boat, jet-ski, bike, and/or car rentals. We can also help you get to and from the airport. > Credit cards accepted, so long as tenant agrees to cover the 2.9% transaction fee. 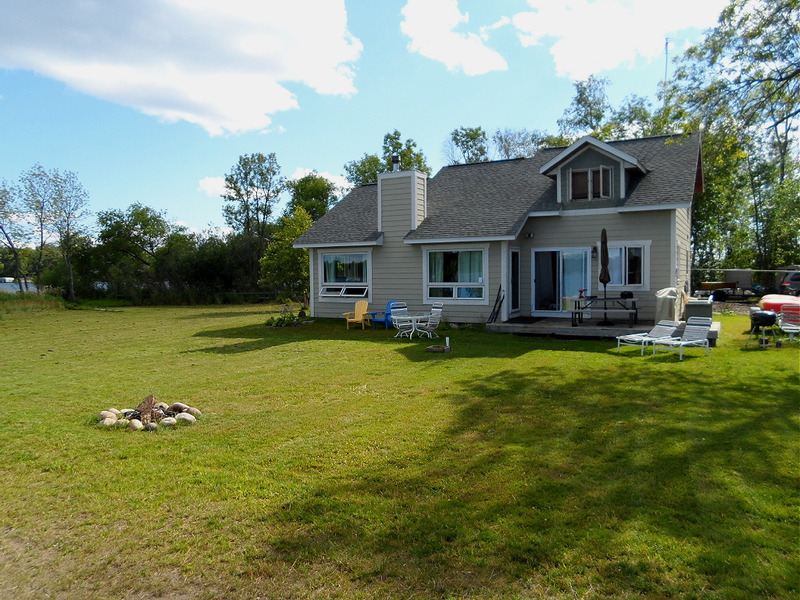 The property is far enough out of town you feel like you're in the Northwoods, but close enough that you may enjoy all of the conveniences of the city whenever you wish. You don't have to pack food for a week, because you can easily purchase everything in town after you arrive. If the weather is great, you can stay on the property all week and never leave. If the weather doesn't cooperate, you can go shopping at the mall or see a movie. The property offers the best of both worlds. Loved the home and the location cannot be beat. Mark was so easy to work with! Our family rented this home from June 17-24, 2017. Absolutely loved the entire experience. Mark, the owner, was so easy to work with and very accommodating. Our family had an absolutely fabulous time. The location literally cannot be beat, it was so peaceful. The two docks were a bonus for fishing and swimming. Nighttime fires by the lake were awesome and even when the other two parts of the lake were a little rough this location was calm and beautiful. You are far enough away from town, but close enough if its rainy and you want to check out in town options for the day. We saw snapping turtles, eagles, loons with their little babies. Listening to the loons and the waves at night is very relaxing. I would highly recommend it to anyone looking to rent a piece of paradise. All the comforts of home and more. Our granddaughter loved her new "castle"! Everyone wants to go back next year! We had a wonderful stay at this property.  The house was very nice, the owner was very helpful and we especially appreciated the child friendly environment. The lake was clean and fishing was great. We will definitely stay again! My family had a wonderful week long stay at this cabin. The cabin itself was beautiful and met all of our expectations and more. 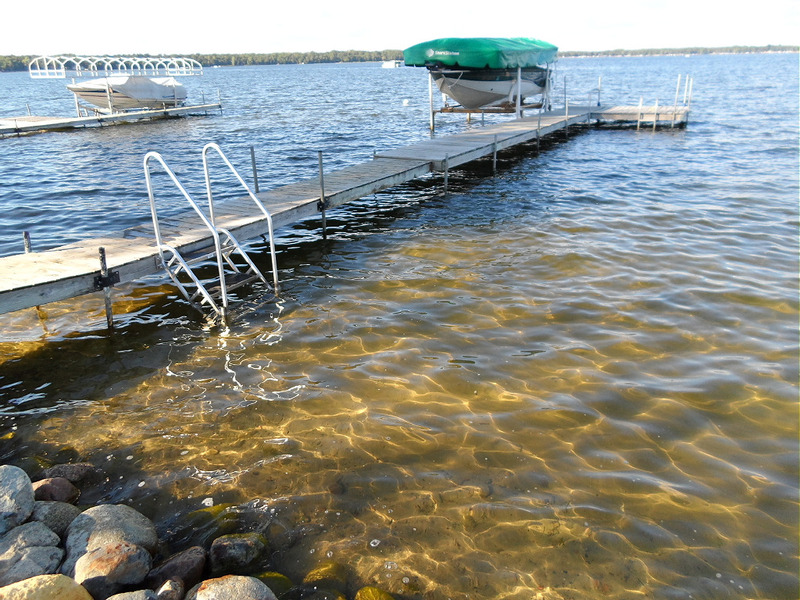 The very shallow, sandy lake bottom made it perfect for our 4 kids ages 2-11. We had a few very chilly days but we found plenty of fun in Brainerd. It was a pleasure working with the owners. If I had to pick one drawback it would be that the yard was very soggy. It had been a very rainy June so that may not be the norm for this property. Overall we all had fun and made wonderful memories which is always our goal! Wonderful Stay for Group of 6 adults and a 1 year old! Out group of 6 adults and one child (1 year old) had a wonderful time! The season was unusually wet making for a bit of a soggy yard, but that did not prevent us from enjoying our time there. We rented a pontoon, but I do not feel like you would need to. 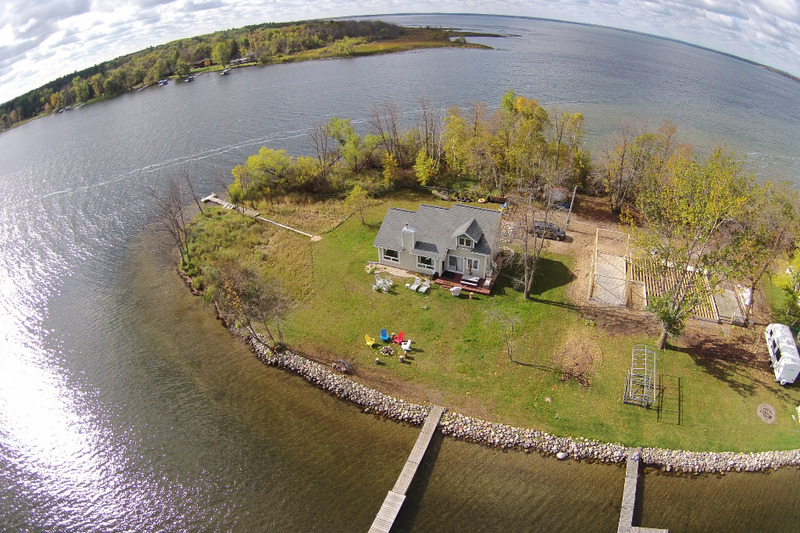 You can enjoy the water with rafts and the dock. The cabin itself was spacious enough and very child friendly. The gates and highchair that were already there were truly appreciated. The space upstairs was perfect for our 1 year old because he could nap there and was away from the noise, plus there was a window air conditioner for just that space which kept it comfortable for him. WE REALLY ENJOYED OUT TIME HERE and would highly recommend it! We stayed toward the end of July with our 3 year old son and had a blast. It was such a wonderful place to escape to for some good old fashioned family fun but with all the modern day comforts. The mornings are so peaceful and it is the perfect spot for a morning cup of coffee and watching the sky lighten over the lake. You feel like the entire world is yours alone at that moment. 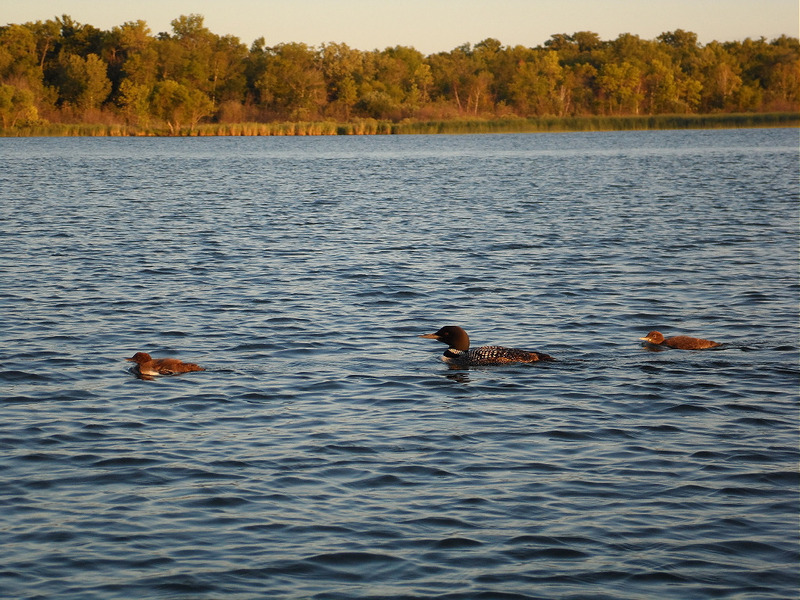 During the day we spent hours taking walks, playing in the lake, boating, fishing and searching for frogs and the baby loons. The evening highlights were s'mores around the campfire overlooking a beautiful lake. After the little one was in bed it was great to sink into comfy leather couches and have wifi and cable tv available. The cabin had everything we needed for our entire stay. With the house being on a peninsula we had a nice cool breeze each night and did not have to turn on the ac once during our stay. The owners were very accomodating and helpful regarding all of our requests. 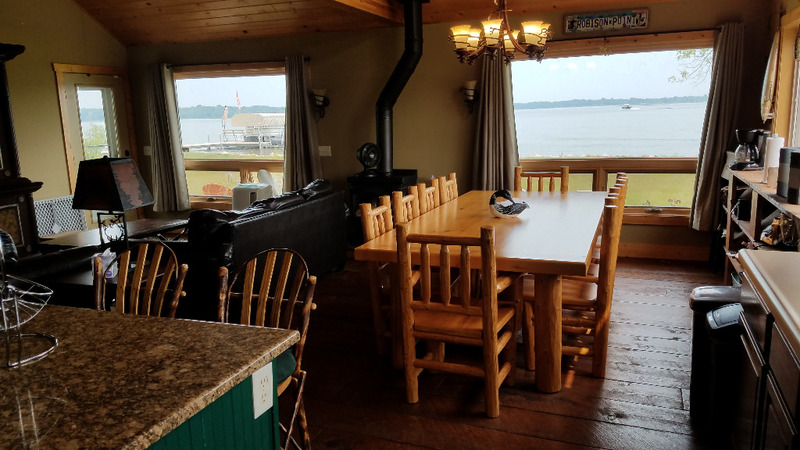 The house was big for our needs but it had everything we wanted for a family get away and you can't beat those lake views!!! Without a doubt we will be coming back next summer. Our little boy still mentions our visit several times a week and can't wait to go back. Thanks for letting us experience your little piece of heaven!